Add the occasional splash of retrigger or stretcher to single hits within your drum loop, or fill the entire sequencer with random effect blocks for a totally chaotic trip down the digital rabbit hole... the choice is yours! Each program consists of 128 scenes that can be triggered via MIDI notes. Each scene has its own unique sequencer pattern, timing, and effect settings, allowing you to create tons of unique variations for every moment in your song, all ready to go at the press of a key! Multi-lane sequencer allows many effects to be played simultaneously, to create interesting layered sounds. Improved sequencer timing controls to better match your groove and song structure. Intuitive pattern editor with drag'n'drop. Draw, erase, resize, split and join blocks with ease. A collection of cheeky little effect modules designed to slice, dice, chop, screw, twist, turn and mangle your sounds into radical new forms. Tempo-synced effects can easily be dialled in to precise musical timings such as 16th notes, 8th note triplets, and so on. Filter, mix, pan and volume controls on each module, to help shape and fine-tune the output. Randomize and Mutate functions can be found at almost every level. Mutate a single effect to get slightly different parameter variations, or instantly Randomize everything in the entire scene to create unexpected, chaotic and inspiring results! The demo version does not save any program data, and will periodically output some background noise. Host with support for VST 2.4 plugins. Windows XP SP2, Vista, 7, or higher. Host with support for VST 2.4 or AU plugins. Linux with GCC 4.X libs, X.org 7.1+. A real-time kernel is recommended. Cursor visibility bug when alt-tabbing in Cubase for Windows. Scenes not always changing correctly in the AU version. Extra playback modes added to Tape Stop effect. Tape Stop range extended for longer slow downs. Volume step sequencer added to Gater effect. Grain size jitter added to Stretcher effect. Effects can now be rearranged to change their processing order. Effects can now be soloed to tweak their parameters more easily. New “gate” and “latch” scene trigger modes. Loop on/off switch added to sequencer, to allow for one-shot playback. When editing a scene during live playback, it can now be locked in place to temporarily ignore incoming MIDI scene changes. Native bank/program format that is compatible with both VST and AU plugins. Random program name generator to amuse and inspire you! Preset banks by Supremeja, Alex Shore, Rick Christy, Sink Music, and more. GUI cleanup and visual improvements. and try the demo before purchasing! The license is for a single user only. Multiple installations are allowed. 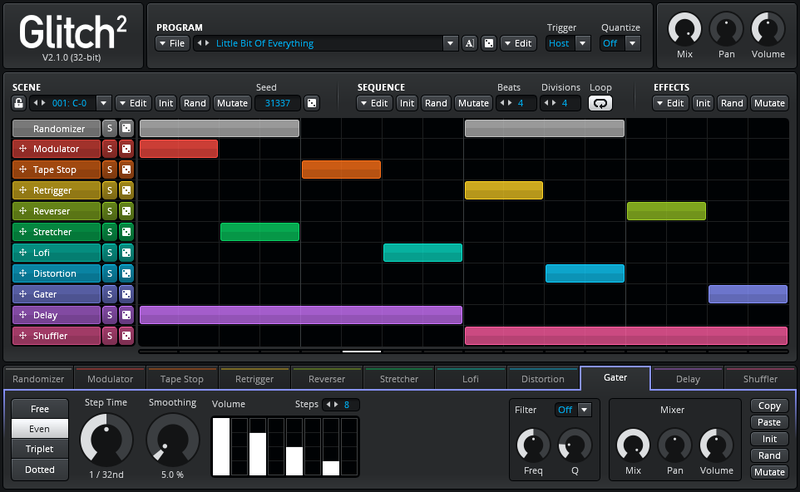 The license includes all supported platforms and plugin formats, and free upgrades from Glitch 2.0.0 to 2.9.9. Glitch is available as a download only. No physical items will be sent to you. When your payment is complete, your license and download instructions will be delivered by email. If you do not receive your license within a few hours of completing the payment, please contact Illformed support. Payments are handled by FastSpring. Please contact FastSpring support if you have any problems with your payment. Please contact Illformed support if you have any technical problems when downloading, installing, or using Glitch.